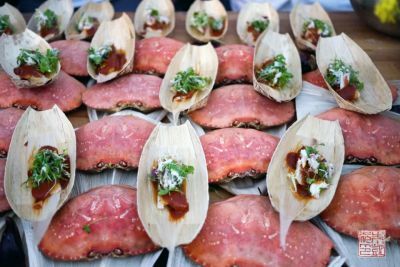 Scroll to down for my report on PBFW! cookbooks are among the most treasured of my entire collection, and getting to meet her in person was a true highlight of my time at Pebble Beach. But the very best part? When I mentioned my site Dessert First, she said she’d seen it!! Can you believe that? Nothing else that happened that day could have topped that. SO happy I got to meet her. 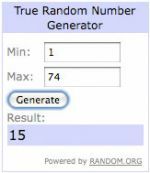 Reader 18, Janyce! Her favorite chef is Masuharu Morimoto – excellent, excellent choice! Reader 62, Karen Diep! Her favorite chefs are her parents; very sweet and touching. Reader 15, Regina! 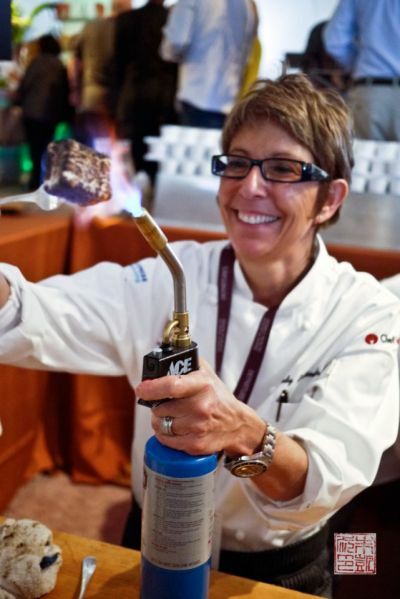 Another vote for Morimoto – did I mention when I saw him at Worlds of Flavor Napa and he brought a smoker carved out of ice?? 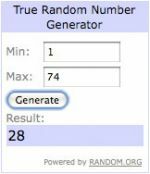 Reader 28, Janett! Her favorite chef is Michael Symon. I remember the first time I read about him in Michael Ruhlman’s The Soul of a Chef and it’s amazing to see how far he’s risen since then. Great guy. On to Pebble Beach Food and Wine. 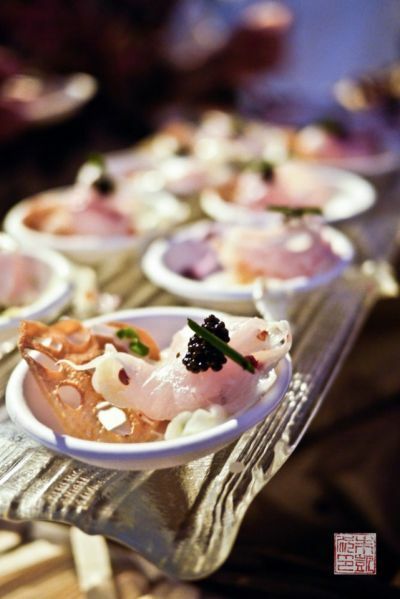 This is my second time at this culinary event; this year I was a guest of Foodbuzz for the Grand Tasting on Saturday. I ran into some other food bloggers there as well, including Lisa, Irvin, Sabrina, and Amy. 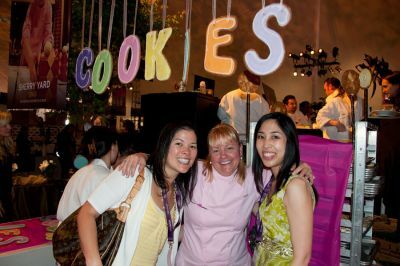 It was fun to have fellow foodies to chat with as we stood in various lines waiting to meet chefs and try their food. Note that Lisa was kind enough to share some of her shots with me – all the photos without the Chinese watermark are courtesy of her. Yellowtail sashimi with yuzu emulsion and lotus root chip. 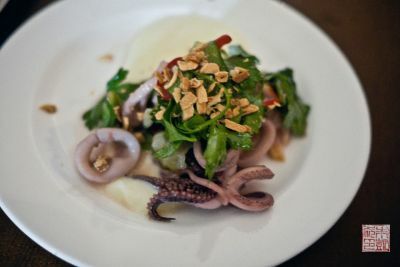 Lotus roots must be the next big thing – I saw them as garnishes everywhere. 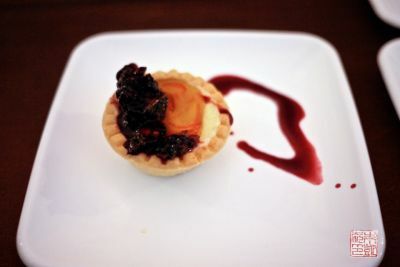 This blackberry goat cheese tart was one of my favorite desserts: flaky, savory, and sweet all in one bite. I asked readers to name their favorite chef for the Pebble Beach giveaway. The chefs who got the most votes were definitely Masaharu Morimoto, Ina Garten, and Michael Chiarello. 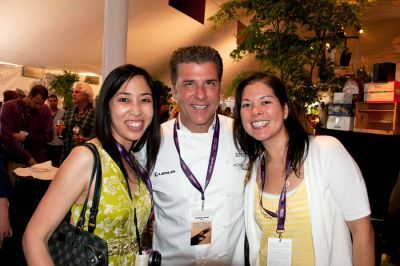 Just for you Chiarello fans, here is me and Lisa posing with chef himself. 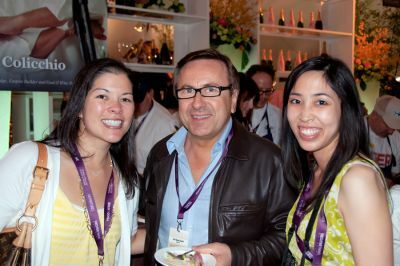 Speaking of celebrity chefs: Daniel Boulud! I am so proud of hubby. He pointed into the teaming crowd and said, “Isn’t that…no, that couldn’t be Daniel Boulud…?” I turned and said, “Yes, it is! !” Chef probably did not appreciate two fangirls descending on him as he was trying to get a bite to eat. Chefs that were not working a table and walking around were definitely targets for the fans, unfortunately! 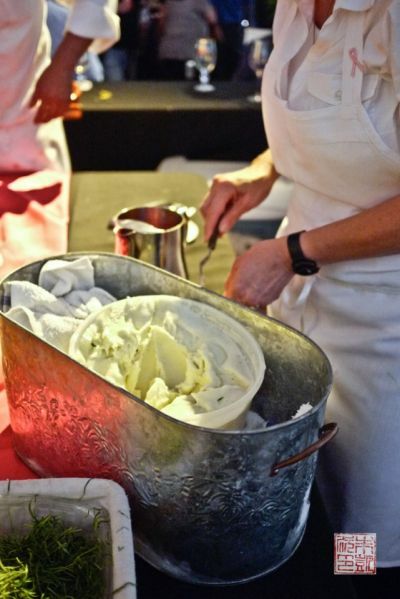 The most unusual sweet I tried: fennel ice cream. Very refreshing after a lot of rich meat dishes. Hedy Goldsmith is so fun and friendly. And I loved her dessert: peanut butter chocolate s’mores with roasted banana jam, bacon peanut brittle, and marshmallows toasted a la minute. 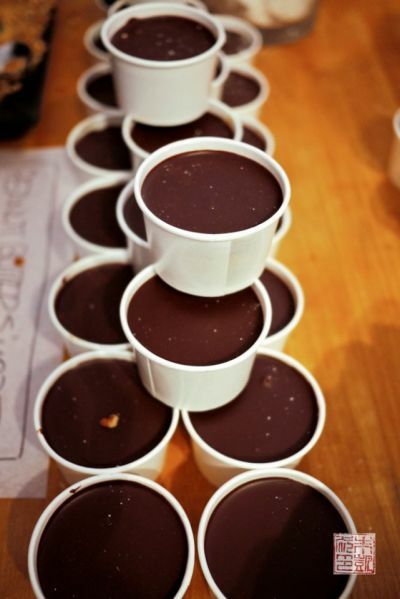 Cups of peanut butter chocolate s’mores waiting for their marshmallow garnish. 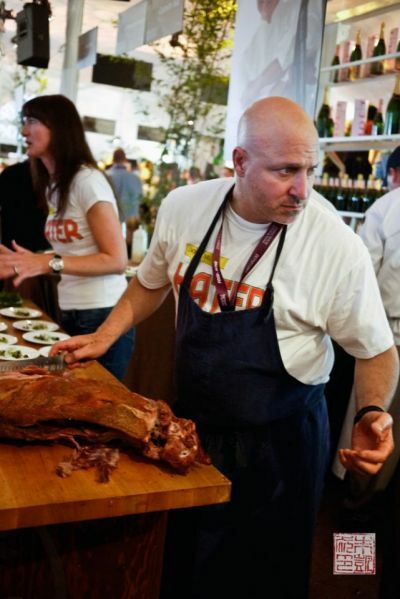 So there’s not a photo of me standing with Tom Colicchio because he was busy carving a pig, and because the line to meet him virtually stretched out the tent. I love his show, but there was too much food we had to try and we couldn’t afford to stand half an hour in line! 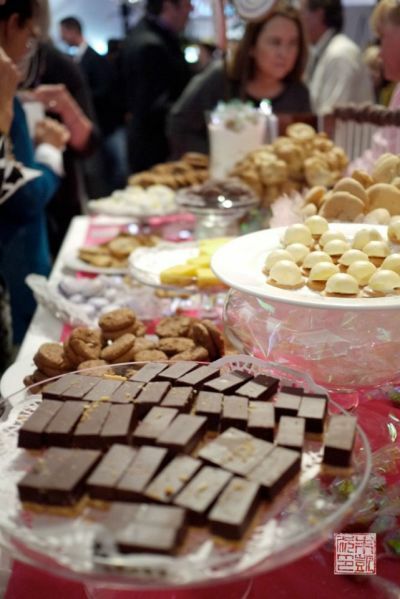 Sherry Yard presented the most whimsical table of the day: a table piled high with cookies of every persuasion, from macarons to ladyfingers to lemon bars. I was so thrilled to be able to talk to Sherry in person – she is as sweet as she looks. Don’t you love the hanging cookie banner above us? I don’t exaggerate when I say she’s one of my baking heroes. I think I got her first book, The Secrets of Baking , before I started this blog, so there’s no review of it on here, but I think it belongs in any baker’s library. Such a great introduction to baking and really helped me understand how all the different techniques and basic recipes are related. You can read my review of her second book, Desserts by the Yard , which goes into detail about how much I love her baking style. And she’s just as I imagined in real life; so cheerful and approachable. 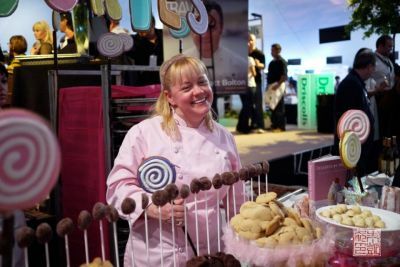 How could you not smile when you saw her pink chef’s jacket and the giant cookie lollipops. And I think that really epitomizes what baking is all about: making people smile. 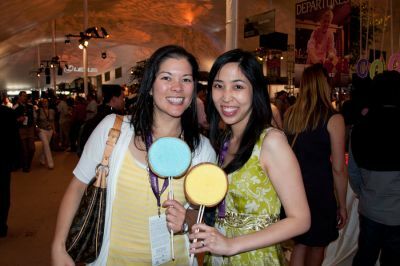 I think Lisa and I got the best souvenirs of the day: giant cookie lollipops from Sherry’s table. I heard people calling us the lollipop girls as we walked out! 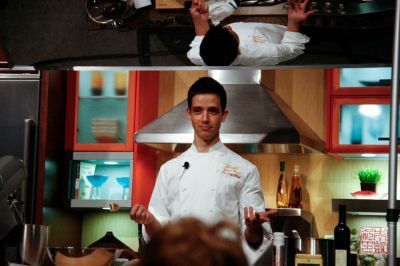 I also got the opportunity to see Yigit’s chocolate demonstration the day before. Using Valrhona chocolate, he showed several basic techniques, including tempering chocolate, making an infused ganache, a cremeux (a sort of chocolate pudding made with creme anglaise, gelatin, and chocolate), and rolling truffles. Yigit has a great personality: funny, chatty (oh yes, he likes to talk! 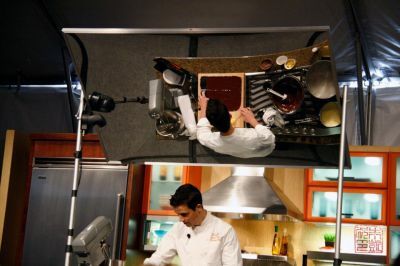 ), and full of stories about his experiences working at Taste Catering and on Top Chef. Yigit’s next project is a pastry shop in downtown San Francisco that he hopes will open at the end of this year. Here is Yigit spreading tempered chocolate on a transfer sheet. I have to give him props for working with chocolate under very obviously hot lights – I prefer to not stack the deck against myself and try to work with chocolate under as favorable conditions as possible, so I was impressed that he appeared not at all flustered and kept up a running patter while accomplishing all his recipes. Yigit got a surprise visit from one of his mentors, Daniel Boulud! 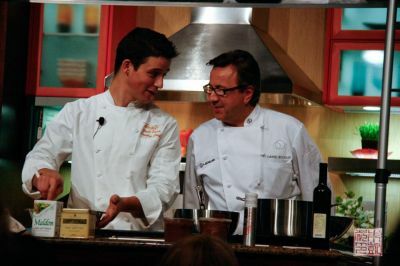 Boulud had nothing but good things to say about Yigit, although Yigit admitted to being nervous at having his former boss looking over his shoulder – who wouldn’t! 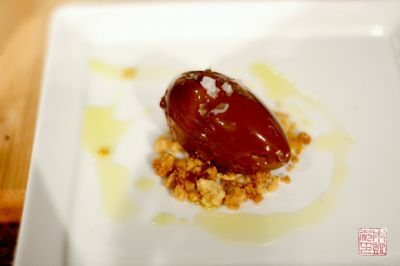 This was Yigit’s final creation: chocolate cremeux with hazelnut crumble, maldon sea salt and olive oil. 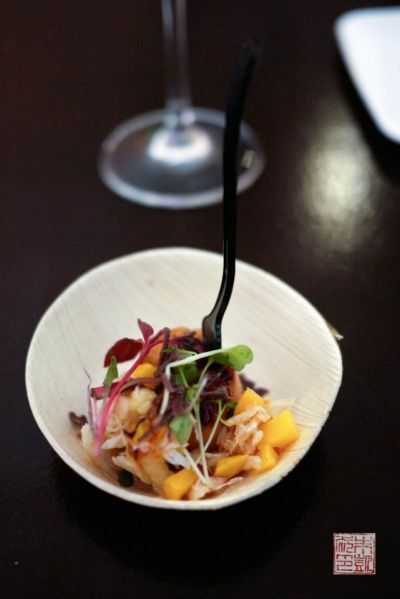 It was a great PBFW and I am looking forward to seeing how they will top it next year! Sunds like a fantatsic event. Can’t wait to hear more! I was there too, I can’t wait to read about the rest of your experience. I’m a fan of dessert first too. Just read this blog~ Totally wish I was there!